I have been planning on moving my PC (in my case a laptop) from Microsoft XP over to Linux for a while. The timing is never convenient to do this kind of project so I have been pushing it off. This machine is about 3 years old and is the longest time between rebuilds that I can ever remember going. Earlier in the week 4gb of ram arrived via Amazon & the USPS. That is a BIG step up from the original 1gb that I have been trying to survive on for a couple of years. I started making a list of the applications that are installed on XP. (I do this for every machine rebuild so that I know what I need to install again & what I can skip.) See the picture below. I am going copy the contents of "My Documents" to an external USB drive. (It is the same drive that store my photos, engineering notes & designs, MP3s, etc.) I try to run a monthly backup of the external USB drive to another drive. Thinking of the backup... I probably should mirror/backup that USB drive prior to the rebuild. I need to export my bookmarks from Firefox on XP to the USB drive so that I can import them once the Linux image comes up. I need to find my Ubuntu build CD or burn another one prior to removing the XP hard drive. 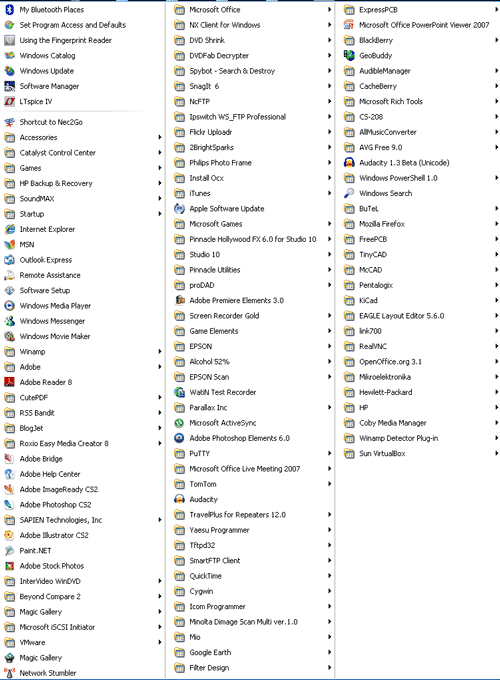 Here is a list of software that I either need to get to work under Linux, replace with something else, or reinstall on the XP virtual machine running in a Virtual Box session. I am using ScribeFire as a FireFox plug-in. BlogJet was a good tool if your an IE user looking for a good offline authoring tool for your blog. ScribeFire is an awesome solution if you are a FireFox user and it runs on Windows & Linux. I have used it with DasBlog and now with WordPress. This installed fine with WINE. I have not thoroughly tested it yet but it seems to be fine with some initial testing. Available on Linux. I am not actively using it at the moment. You can use "Gerbv" to view the gerber file natively with Linux. This seems to work ok, but I need to figure out how to print the image in an invert fashion. I think that I can tweak the print driver to it (that is how I did it in Windows) but it is not just a simple check box. I did install ViewMate once I discovered a cool hack to be able to get the C++ 2008 SP1 library installed. Run the C++ install with the Winehack script: http://wiki.winehq.org/winetricks Then ViewMate will install fine. Once again I need to figure out how to print the inverted image. I noticed that ViewMate looked like it had a broken trace when used with WINE. I will need to test it some more. Another approach is instead of using the Gerber file from FreePCB that I could just use the PNG version of the file and Print it from GIMP which should allow me to invert the image at the same time. Another approach to this might be to install ViewMate in the VirtualBox XP session as a backup. Some times I am in a hurry when I need to print a file to make a homebrew circuit board and this is probably a good fall back just in case. Gmail reader at the moment so that I can use it across multiple machines. Using the built in screen capture tool. This will install under WINE once you add the MDAC components and then upgrade the JET to Service Pack 8 (I choose the Win95/NT4 update for SP8). TinyCad seems to open & print fine via WINE. --One issue so far... the Tool Dialog box does NOT open up. I am running TinyCad in a Virtual XP session until I figure out a work around. Once I move some data & mirror the external USB drive I am probably ready to start the rebuild. With a little bit of luck maybe I can start that after dinner tonight. This is going to put a big dent in my productivity for a while this weekend as this is my main PC for productivity work on the home front. I am excited to remove XP and move to Linux on this machine. Once I am done it will signal that I have pretty much moved from XP to Linux as it is the last major machine here that is still based 100% on Windows. More posts & updates as the project progresses.